To be a Templar Knight one has to be the son or descendant of a knight. Templar Sergeants are professional soldiers unable to become Knights. 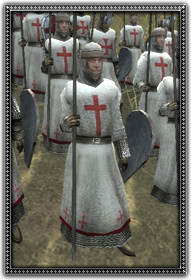 Armed with a spear and light armour, these Templar brethren are very effective against cavalry and no less belligerent on the battlefield than their knightly brothers.